A new poll suggests John McCain is on defense in states Pres. Bush won. WASHINGTON (CNN) - New polls suggest that John McCain is on defense in four of five states that President Bush won in the last election. CNN/Time Magazine/Opinion Research Corp. surveys released Wednesday afternoon indicate that Barack Obama has a small advantage in Ohio, Nevada, North Carolina and a large lead in Virginia, with John McCain ahead in West Virginia. Democrats last carried North Carolina in a presidential election in 1976, but the poll suggests that Obama, D-Illinois, has a 4-point margin - 51-47 percent - over McCain among likely voters. That is with within the poll's sampling error, but it is an increase over our last survey in North Carolina two weeks ago, when Obama was tied at 49 percent with McCain, R-Arizona. Fifteen electoral votes are at stake in North Carolina. "The North Carolina poll exhibits the same gender gap and generation gap that national polls typically show," CNN Polling Director Keating Holland said. "McCain has a slight edge among men and voters over 50 years old; Obama has a slightly bigger margin among women and younger voters." You have to go back to 1964 to find the last time Democrats won Virginia in a presidential contest. But the poll indicates that Obama continues to hold a comfortable lead over McCain in Virginia, 54-44 percent. Obama held a similar 10-point advantage over McCain in our poll from last week. "Obama's lead in Northern Virginia is growing," Holland noted. "He now beats McCain 2-1 in the Washington suburbs." Virginia has 13 electoral votes. It all came down to Ohio four years ago, with the state putting Bush over the top in clinching his re-election. And our new poll suggests that it could again all come down to Ohio and its 20 electoral votes. Fifty percent of likely voters in Ohio questioned in the poll back Obama for president, and 46 percent support McCain. Obama's lead is within the poll's sampling error. Suburban voters could again be crucial to determining the outcome in Ohio. "The suburban vote in Ohio is split right down the middle, 48 percent to 48 percent," Holland said. "That's a familiar pattern for anyone who follows Ohio politics. Four years ago, the suburbs in the Buckeye State went for George W. Bush 51 percent to 49 percent." Nevada voted for Bush in the past two elections, but the survey suggests Obama retains a small advantage in the state, 51-46 percent. The lead is also within the poll's sampling error. Bush carried West Virginia by 13 points in 2004 but the poll indicates McCain has a smaller 9-point lead over Obama, 53 percent to 44 percent. There's an interesting trend in these five new polls. "In every one of these states the decline in the Republican vote is larger than the gain the Democratic vote," said CNN Senior Political Analyst Bill Schneider. "One reason is there may still be uncertainty among voters about Obama, but there's no uncertainty about the loss of confidence in the Republicans. "The two states where we see the biggest shift in the Democrats' favor are Virginia and North Carolina, which have the largest populations of African-American voters. Democrats have made a gain of 9 points in Virginia and 7 points in North Carolina from the results of the 2004 presidential election," Schneider added. With these new polls factored in, the CNN Electoral College Map estimates that if the election were held today, Obama would win states with 277 electoral votes, with McCain taking states with 174 electoral votes. States with 87 electoral votes are still up for grabs. Two-hundred and seventy electoral votes are needed to win the White House. State surveys, campaign advertising buys, candidate visits, and voting trends are all taken into account in calculating the CNN Electoral College map. Likely voters questioned in the polls were also asked about whether they would support either of the three major third-party candidates, Independent Ralph Nader, Libertarian candidate Bob Barr, and Green Party candidate Cynthia McKinney. But none of the three registered more than 3 percent of the vote in any of the five states surveyed. The CNN/Time Magazine/Opinion Research Corp. polls were conducted Sunday through Tuesday, with 700 likely voters in Nevada, 644 likely voters in North Carolina, 737 likely voters in Ohio, 647 likely voters in Virginia, and 674 likely voters in West Virginia questioned by telephone. The survey's sampling error is plus or minus 3.5 percentage points in Nevada and Ohio and plus or minus 4 percentage points in North Carolina, Virginia and West Virginia. Living in Ohio I am concerned about the republicans buying the election for McCain in Ohio like they did for Bush in 00 in Florida and 04 in Ohio. Wasn't it the CEO of the company that made the polling machines that promised Ohio to Bush before the Election? Everyone in line was voting for B.O. it seemed. I noted that discrepancy too. My guess is that the 37 is a typo, if it were 47 that would equate to the 4 point lead mentioned. I live in a state that always goes "red"—-I just wish the rest of my state would wake up and vote for change!!! Mari, I'm in the same boat you're in and I too wish that folks wake up! CNN, I cant believe you refuse to report about Plain’s wardrobe expenditures. By the way, I love how Obama supposedly has only a small advantage in Nevada, when early voting results show twice as many democrats have come out to vote than republicans. Do you really want me to believe that they voted for McShame? Get real. polls mean nothing. mason-dixon has obama ahead of mccain 2 points in va. real clear politics has the margin in va as obama by 5-6 points. cnn has obama with a 10 point spread. the important thing is to vote because the polls vary. Geeze do you think that perhaps McCain is hurting himself with all of his negative ads and untrue rhetoric? He has yet to offer me any reason to vote for his ticket......................................A very negative, bitter man and a a radical female is the last thing this country needs. Weird that an article which states "it could again all come down to Ohio and its 20 electoral votes" then goes on to make it absolutely clear that with all the other states that are currently newly blue, it couldn't possibly "all come down to Ohio." This is one poorly written article as the other jd noted "Democrats last carried North Carolina in a presidential election in 1976, but the poll suggests that Obama, D-Illinois, has a 4-point margin — 51-37 percent"
Not to mention McCain is "is on defense in four of five states that President Bush won in the last election" but later "our new poll suggests that it could again all come down to Ohio and its 20 electoral votes". 4/5 states leaning Obama = it could come down to Ohio. Doesn't make much sense. Anyone else sick of the polls -that's for Obama and McCain to figure out – let me know about the 1 that matters in November. 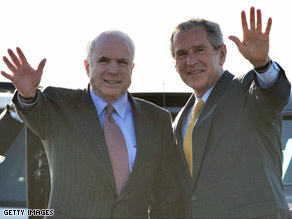 In the picture Bush looks like a younger version of McCain. Notice how they coordinated their "hand wave". WOW!! good wrork! Stay focused ... it ain't over till it's over! "Religious voters moving toward Obama" says a CNN report. This comes as no surprise. I know pastors who don't like what is coming from the Republican camp, i.e., transgression. John McCain.. How could you have been tested? You have NEVER been President! If you handle an international crisis like you have handled our current economic crisis, WE ARE ALL IN BIG TROUBLE! By the way–May I use this picture for my Christmas cards this year? I sent my ballot in last week. I did my part, so everyone else please do theirs, the only way to fraud-proof the election is to have so many democratic votes counted in as many states as possible so republicans have notway of viably cheating the system. You know they are poised to say that one state voted more republican rather than democrat in a close race. The sooner this appears as a clean win, the sooner "geezer and gidget" will get out of our faces. Don't leave them any room whatsoever to question anything this time!!!! I already voted for Obama then Straight Dem in early voting. We hope NC is dark blue this year ! !